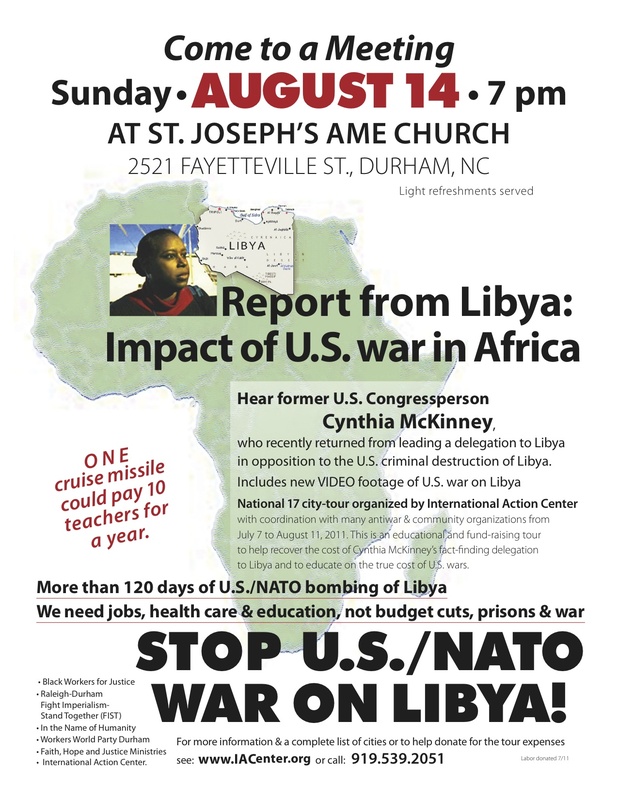 We are excited to announce two North Carolina events as part of former US Congressperson Cynthia McKinney’s national “Libya Truth Tour” to reportback on the impacts of US/NATO wars in Africa. McKinney recently led a fact-finding delegation to Libya during US/NATO bombings of that country. She has traveled and written extensively exposing the truth about the US role in broadening attacks on Libya and other African nations, and will report on the realities on the ground in Libya, relate her experiences there during the delegation, and break through the many myths and lies that are propagated in the US corporate media about Libya and the people there. This will be an evening and a perspective that you won’t want to miss, that will help provide clarity for the role the movement here can play to come to the aid and defense of the people of Libya. In order to be able to bring us this unique analysis, Cynthia McKinney incurred many travel and other costs during the delegation to Libya, and this event is a fundraiser to help defray those costs and insure that McKinney can continue to do the work that she does. A minimum $10 donation will be asked at the door (though no one will be turned away for lack of funds). We invite any organizations or individuals who are interested in co-sponsoring and supporting this reportback to please contact us to submit a donation prior to the event, and to please help solicit donations from your members, neighbors and friends. RSVP and invite your friends on Facebook by clicking here!